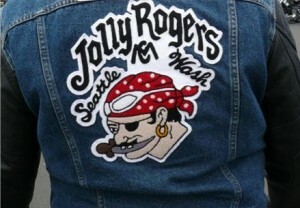 The Great Seymour asked I, Sprocket if I’d care to share with the world my time spent with the Jolly Rogers. I agreed, and am writing from the best of my recollection starting when I joined the club at the end of 2007. A brief background first. Was a parts guy for both an independent shop and dealership. At the age of 54 I’ve been involved with a half a dozen clubs. Seen my best clubber and friend die, have owned my FXRS for the past twenty three years, that would be Harley speak for you metric riders. With that out of the way, lets move on. It was a funny thing when I wore that patch between my shoulder blades. It was instant recognition. Anywhere I went guys would stop and tell me what they knew of the patch, or a story about a long lost relative that had joined, or the conversation would come back to the long lost track and hill climb. I would stand there and let the individual spout off because I was a newbie and didn’t quite yet know my 60 years of club history. But that was about to change. I rode down to the Central Tavern” in Pioneer Square for “biker” night. It reminded me of high school in that everybody was clicked up into their various groups. There was a strong showing of Bandido MC, the Resurrection MC, and a whole bushel of wanna be’s like moths drawn to a flame. I was a curiosity because more people have heard about the club than actually standing eye ball to eye ball to what was perceived to be a ghost. The membership at the time was in decline but in the following years the club grew in leaps an bounds. How much you might ask, and the stock answer is that’s club business. I was introduced to a short jovial fellow by the name of Strokker. As it turned out in our conversation, we lived a mere 4 blocks from each other. I remember he had quite an assortment of Bandido patches indicating that he was a member for some time. Also he had a side kick in civilian clothes with the termination for never letting Strokker’s drinks go dry. Looking back, I remember making one of my biggest blunders in that I was spouting off my knowledge of Bandido Presidents in order no less, to the point where my habit of talking too much raised it’s ugly head. For a few uncomfortable moments I was probably perceived as some kind of narc. And that’s not a good thing in the big boy’s world. I rallied, talked about his red and gold Shovel which was quite obvious he was proud of his scoot, as he should be. I left that night with some lesson’s learned, was a Road Captain for the club and my claim to fame is I got everybody safe to the following Oyster Run. That included members and quite a few quest’s came on the run. Now, just another old guy with stories. This entry was written by fingers, posted on August 6, 2013 at 6:44 am, filed under History. Bookmark the permalink. Follow any comments here with the RSS feed for this post. Post a comment or leave a trackback: Trackback URL. 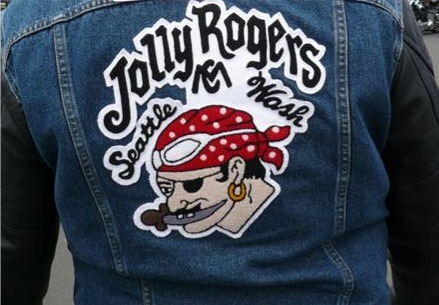 « We are looking for available videos and pictures from the Jolly Rogers Racetrack.